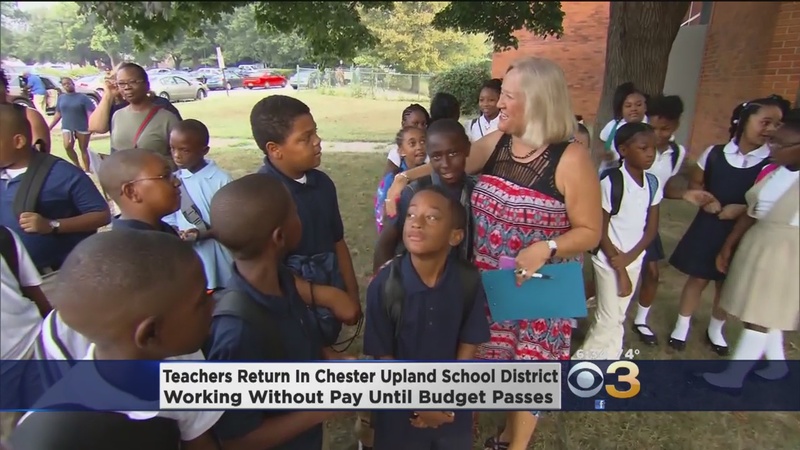 Today, 200 public school teachers working for the Chester Uplands County school district in Pennsylvania should be receiving their first paycheck during this school year. Unfortunately, these teachers will not be receiving their checks, as the school district hasn’t managed to allocate the funds to pay what they owe. Despite the unwillingness of the state to pay their salaries, these dedicated teachers voted unanimously to start the school year as normal and to work without pay until the state can reconcile the funding gap. The students served in the Chester County public schools are predominantly poor and African American. They are the most vulnerable students imaginable and these teachers need to be commended. Unlike people who are motivated by pure profit, these teachers are looking after their students and are demonstrating just how dedicated to teaching and public service they are. This situation was caused by a combination of local poverty, state politics, and bad educational policy. The local government cannot pay for its schools purely through property taxes so it relies on the state to supplement its funding. Because the county schools are dependent upon state transfers for their funding, this makes them very vulnerable to political infighting. The Pennsylvania state legislature is controlled by the Republicans, who are trying to push austerity and tax cuts, while Governor Wolf is a Democrat, who is trying to sustain funding for local schools. This divided government created a deadlock that has prevented the passage of a budget this summer (it was due in July), putting a lot of local funding in limbo. Until this deadlock is reconciled, funding will not go out to many programs and the schools will not be funded. While it is attractive to just blame government dysfunction and Republican extremism for this situation—and the GOP’s insistence on cutting local education funding is certainly the largest reason why this crisis is happening in the short-term—there are long-term systemic problems that go far deeper. The roots of this crisis are based in school reforms that rely on charter schools, privatization and voucherization. Well intentioned charter school policies have exacerbated the funding problems within public school system like the one in Chester Uplands County. 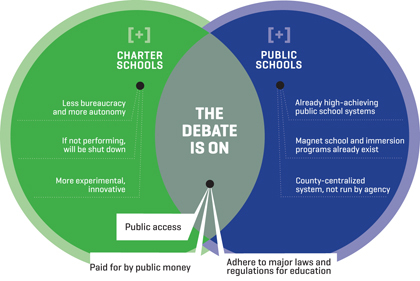 Just at the outset, it is important to differentiate between traditional public schools, charter schools, and private schools. Traditional public schools are fairly self-explanatory and are simply the basic public school that you likely attended as a child. Charter schools are non-traditional public schools that are given latitude by the state to implement their own educational reforms (ex. an increased reliance on remote/online material) and the funding to carry those reforms out. Charters are non-profit entities, but can be run by for-profit entities (like the ones in Chester Uplands County). Private schools are private, sometimes for-profit but mostly non-profit, schools that are paid for through a mixture of vouchers (public funds), scholarships, and private funds. Private schools are exempt from state curriculum and testing requirements and range from religious schools to high-quality prep schools. Currently, more than half (3,800 out of 7,200) of the students living in Chester Uplands County are attending charter schools. These charter schools were originally intended to provide an alternative to the low-achieving traditional public schools for students who wanted a better education—they promise cutting-edge teaching methods, better programs, and reformed delivery systems that make schools cheaper, more accessible, and better for students. Unfortunately, these promises are not based in reality. Charter schools in Chester Uplands County have drained the resources from the public schools and cherry-picked away the best students, creating underfunded traditional schools that must teach the most difficult students. They waste money and create a system of tiered education where students who do not get into charters suffer a substandard education. This problem is most clear in the disparities that surround the teaching of special education student. According to state funding agreements, charter schools receive $40,000 per school year for every “special education” student they teach, while a Chester Uplands public school only receives $16,000 for teaching that same student. As the term “special education student” is not defined to control for specific conditions, this means that a student with minor speech impairments (ex. dyslexia) would receive the same level of funding as a student with an extreme emotional disorder (ex. extreme bipolar). Charter schools have taken advantage of this funding disparity by cherry-picking the students with the least severe disorders out of the public school system and manipulating entry requirements to exclude the most expensive. Francis Barnes, the Chester Uplands County Receiver, looked at the breakdown of the special education programs at public and charter schools and found that public programs were disproportionately filled with students with severe and expensive disorders, while charter school programs were disproportionately filled with students who had minor disorders. For example, public schools took care of students with expensive autism-spectrum disorders and intellectual disabilities at approximately quadruple the frequency that charter schools did. Approximately 8.4% of the public school special education population is autistic, compared with 2.1% of charter school special education population. Similarly, 11.6% of the public special education program is intellectually disabled, while only 2.8% of the charter program population is. On the other hand, charter school special education programs were filled with dramatically more students who have inexpensive disorders. Only 2.4% of the public school special education population is speech or language impaired, compared with 20.3%, 27.4% and 29.8% in each of the three charter schools in the area. Charter schools’ ability to select the special education students who are easiest to manage and cheapest, while extracting higher compensation for their work, creates an incredibly imbalanced playing field. By concentrating risks and costs in the traditional public system, they have made it extremely difficult for these schools to operate within budget. They have also used their enhanced compensation regime (set by the state legislature) to extract a disproportionate percentage of the education budget and take up resources that would otherwise be available to pay for traditional schools (ex. every special education student to be in a charter rather than a traditional public school increases overall costs by $14,000). Legally, charter schools cannot be for-profit, but there are loopholes that private companies can use to exploit charters to make a profit. A private for-profit, entity can create a non-profit foundation that establishes a charter school and “hires” its parent company to manage the charter school. The for-profit entity can extract significant “management fees” from the state through the intermediary of the non-profit foundation. While this arrangement may seem ridiculous, it is very common and the very arrangement that the largest charter school in Chester Uplands County (Chester Community Charter School) is run under. In addition to extracting “fees” from the state, charter managers can direct charters to buy “educational materials” created by their subsidiaries in order to make a massive profit. They control the supply and the demand for these educational goods and are able to use public money to make their purchases. The profit-generating component within many charter school arrangements creates a very real concern that they will become little more than a tool for private entities to extract profit from the state. Any profit made by these corporations is money that has been directly removed from the money available to fund public education and is a significant drain on the system. Lobbying from these corporations has been extremely aggressive and they will do almost anything to protect their profits. The acute cause of the funding crisis in Chester Uplands County is the recalcitrant GOP legislature and they must be brought to task. 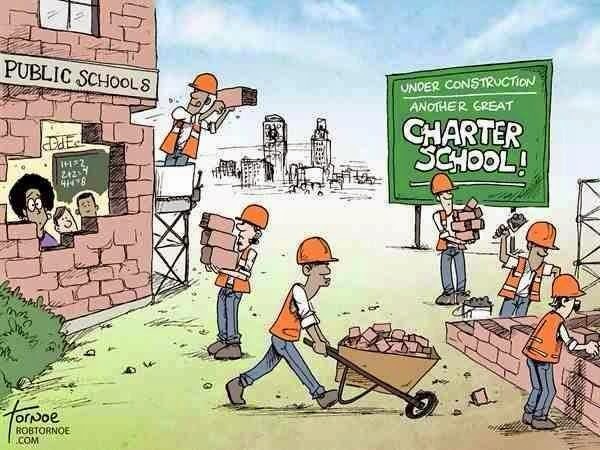 Voters must demand that these politicians fund the schools and stop trying to destroy society one brick at a time. After funding is restored, these voters must also question whether they should re-elect a group of people who would force teachers to work without pay (or rather, choose between working without pay and seeing their children lose their education) in order to enact tax cuts for the wealthy. That said, after addressing the acute cause of this crisis, we must dig down into the systemic problems that have made such funding fights more likely—we must address the efficacy, efficiency, and fairness of Charter school programs and carefully weigh their gains with their detrimental effects on traditional public schools. In some cases, like that of Chester Uplands County, we must determine whether charters are a drain on the school system and begin closing those which are causing more harm than good.